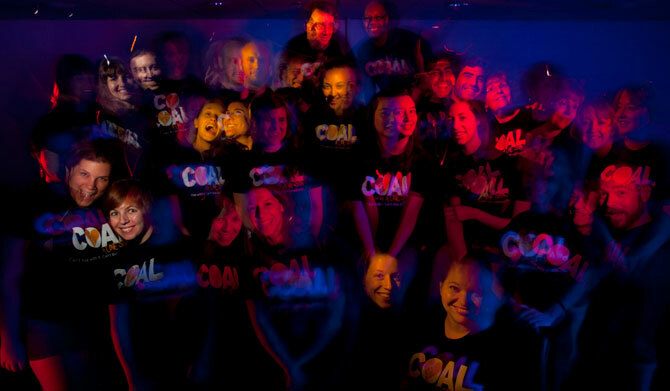 “Coal: A Love Story” explores our modern culture’s complicated relationship with coal. Almost half of the nation’s electricity is generated from the burning of coal. Despite the fact that we rely on electricity for nearly everything we do, few of us are aware of how it is generated. Whether we like it or not, we are in a complicated relationship with coal for the foreseeable future. The purpose of this project is to start a conversation about our multi-faceted relationship with coal through personalized video stories, written pieces and graphics. “Coal: A Love Story” is a groundbreaking multimedia report that represents a shift away from traditional journalism. Utilizing an immersive online experience, the website challenges the viewer to engage with energy issues in a highly personalized way. For Powering a Nation, Caitlyn’s roles include video editor, videographer, photographer, writer and copy editor. Caitlyn is a recent graduate of UNC-Chapel Hill, where she studied visual communication, Spanish and business administration. She is especially excited about the intersection of art, journalism, cinema and technology in storytelling. During her time at UNC, Caitlyn worked on award-winning team projects in Mexico, India, Bangladesh and Argentina as a photographer, videographer and video editor. She is currently in post-production on her honors thesis project called IMMORTAL, a non-traditional documentary about our obsession with not dying. Her work has been recognized by the Hearst Foundation, College Photographer of the Year and North Carolina Press Photographer’s Association. For Powering a Nation, Catherine’s roles include editor-in-chief, videographer, video editing, photographer, writer, researcher and copy editor. Catherine is a multimedia journalist specializing in documentary storytelling. She received her bachelor’s degree from the College of William and Mary and recently completed her master’s degree at the University of North Carolina, where she was a Roy H. Park Fellow. Catherine was a contributing multimedia producer for the award-winning project “Now What, Argentina?” and a multimedia producer and project manager for the acclaimed “CPJW-Little Switzerland Stories.” She recently released her thesis project, “Dreams Delayed,” a multimedia documentary project about people whose daily lives are affected by college access for undocumented students. For Powering a Nation, Catherine’s roles include videographer, video editing, photographer, writer and copy editor. Catherine is a Roy H. Park Fellow and master’s candidate in multimedia storytelling at UNC-Chapel Hill. Before returning to grad school, Catherine studied radio documentary at the Salt Institute for Documentary Studies. She spent the past five years working as a radio producer in Seattle, freelancing for national NPR affiliates and podcasts. Her most recent documentary, “Enough to Survive,” profiled trash pickers in Mexico City. For Powering a Nation, Delphine’s roles include managing editor, marketing director and graphic designer. Delphine is a marketer who specializes in social media and guerrilla marketing. She recently received her master’s in strategic communications from the University of North Carolina School of Journalism and Mass Communication, where she was a Roy H. Park Fellow. Her thesis project was entitled “Guerrillas in the urban jungle: marketing plans for the Broadway musicals, In the Heights and Shrek the Musical.” Prior to returning to school, Delphine worked for the research and evaluation department at Ipas. She also served as the national director of communications for Theta Nu Xi Multicultural Sorority, Inc. She recieved her bachelor’s degree in visual communications from UNC’s School of Journalism and Mass Communication. For Powering a Nation, Hadley’s roles include graphic designer and videographer. Hadley is a multimedia artist and documentary photographer completing her master’s thesis in visual journalism at UNC, where she has been a Roy H. Park Fellow. A graduate of Wesleyan and Columbia Universities, her experience includes architecture, art education, graphic design and rock-and-roll writing/management/promotion. She produced “Last Man Standing,” a short documentary about heroin addiction and HIV prevention; “Birth: A New Paradigm,” which explores different types of birth environments, care providers and experiences; and an interactive motion graphic explaining 40 years of Argentine economic history. She is coordinator, grant writer and photographer for “Las Abuelas de la Plaza de Mayo and the Search for Identity,” a feature-length documentary about Argentina’s Dirty War. She also enjoys yoga and scuba diving. For Powering a Nation, Hely’s roles include writer, copy editor and researcher. Hely is a master’s student at Harvard’s Kennedy School of Government, where he was awarded the merit-based Dean Carnesale Fellowship. He is studying the intersections between business and government as well as media and politics. He worked in Washington, D.C., for the Organization of American States, where he had a range of responsibilities involving political risk analysis. Before that, he worked as a political analyst for the D.C. Embassy of Venezuela and held a number of other positions in Texas and in Virginia working on political elections and in international business. Hely is a graduate of the University of Texas at Austin. For Powering a Nation, Jeff’s roles include copy editor, writer, researcher, videographer and photographer. Jeff worked for the U.S. EPA’s Office of Inspector General in Research Triangle Park evaluating air quality programs. He was a vice president and senior analyst at Bank of America working on green building, sustainable purchasing, renewable energy issues and more. He then designed, implemented and managed a national sustainable manufacturing initiative for a D.C. nonprofit, NACFAM. The U.S. Department of Commerce appointed him to the OECD’s Advisory Expert Group on Sustainable Manufacturing and Eco-Innovation. He is now working toward a master’s degree in journalism and mass communication. Jeff holds the following degrees: A.B. 1999, Psychology, Davidson College. M.E.M. 2003, Resource Economics and Policy, Nicholas School of the Environment and Earth Science, Duke University. M.B.A. 2007, Entrepreneurship and Sustainable Enterprise, Kenan-Flagler Business School, University of North Carolina at Chapel Hill. For Powering a Nation, Kristen’s roles include graphic designer, programmer and copy editor. Kristen is an interactive designer and recently earned a degree in visual journalism at UNC, where she was the director of interactive design at the Reese Felts Digital Newsroom, an experimental news project. She has created websites and worked with clients both as a multimedia designer at Swarm Interactive and in freelance work. Kristen created infographics for the award-winning Living Galapagos project. She has held leadership roles in UNC’s Online News Association and Society for News Design. She is a former graphics editor at The Daily Tar Heel and a former graphic design assistant at the Department of Marketing and Design at UNC’s Student Union. After News21 Kristen will work as a graphic designer at Politico. Her portfolio is available at http://kristenelong.com. For Powering a Nation, Mimi’s roles include videographer, video editing, photographer, writer and copy editor. Mimi is currently a Roy H. Park Fellow master’s candidate at UNC – Chapel Hill. She holds a B.A. with honors in Community Studies from U.C. Santa Cruz where her senior thesis was a photo-documentary study on the effects of gold mining in the state of Nevada. After graduation, she worked at Rainbow Grocery, an employee-owned cooperative in San Francisco, and helped to strengthen workplace democracy through her participation in the Network of Bay Area Worker Cooperatives. In 2008, she studied photography at the Salt Institute in Maine. She has been a special contributor to several publications. For Powering a Nation, Sarah’s roles include graphic designer and videographer. Sarah graduated with a B.A. in graphic design and editing in May 2011. As an undergraduate, she explored in photojournalism, international affairs, information science, Arabic, advertising and art, to name a few topics. She traveled with documentary teams to international locations including Haiti, India and Bangladesh, interned in the UNC chancellor’s office on a campus-wide campaign for innovation, and led the design of a campus travel magazine. In her senior year, she worked as a multimedia journalist for reesenews.org, the journalism school’s experimental online newsroom. She also produced a documentary project about the local music scene, which she submitted for undergraduate honors. When she has time to have fun, she likes to ride her bike, sit outside at coffeeshops and play with friends. For Powering a Nation, Whitney’s roles include programmer, graphic designer, writer and copy editor.